Last year, I made it one of my goals to triple the average daily traffic on my blog. I had a pretty good set of objectives for achieving this. 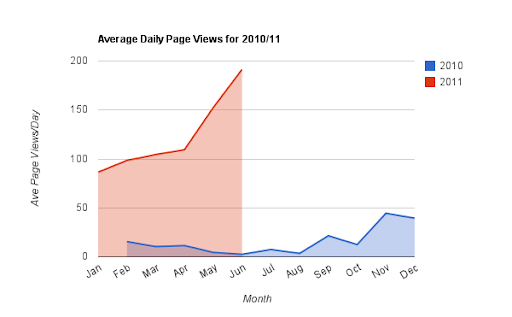 By the end of 2011, I wanted to be averaging three times as many views as I was at the end of 2011. What I didn’t do at the time was specify numbers. I’m not sure why that is, but I suspect that I was somewhat embarrassed by the low numbers I was seeing. Looking back, that seems a silly reason to not be specific in numbers. I had planned to report on my progress toward this goal at the end of June–the halfway point for achieving my goal–but I realized that I am going to be extremely busy at the end of the month. Since we are only a week shy of that, I thought I would do the post now. And I will use my real numbers, since my example might help others who are looking to do the same thing on their own blogs and websites. Before I get into the details, I wanted to point to a post I wrote some months back on online presence for writers. This post summarizes many of the strategies I have used to try to make the content of this blog more useful and interesting to readers and attract new readers. Having established the why, let me dive into the stats. I should also note that the data that I am working with goes back to February 2010, which is when I first migrated from LiveJournal over to a self-installed and self-maintained version of WordPress. As I stated earlier, my goal for this year was to triple the number of hits to my blog over what I had done last year. Let me be more specific here: my aim was to triple the average number of daily page views by the end of 2011 over what it was at the end of 2010. I chose this metric in part because it is pretty easy to track. 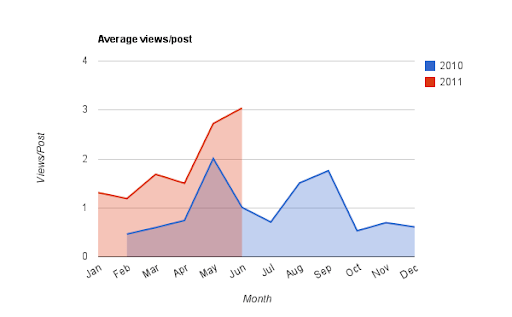 So, what was my average daily page views for 2010? According to WordPress stats it was 15 page views per day on average overall for 2010. 42 page views/day does not seem like much, and I think this was part of my hesitation in sharing the numbers when I set the goal at the end of last year. Tripling that number by the end of 2011 seemed to be a reasonable goal. It would mean roughly 120 page views/day by December 2011. So, at the halfway point, how am I doing? It takes a while for things to pick up steam. You don’t hit your goal overnight. But I think my exposure through various channels like my Wayward Time Traveler column on SF Signal or my Vacation in the Golden Age has definitely helped with the jump. I had a¬†total of 5,004 hits for all of 2010. So far, for the first half of 2011, I’ve had just about 20,900 hits. Assuming that my average daily views were to flatted out today (at 191), that would make for about 55,600 views for all of 2011. That is more than¬†ten times 2010. The thing is, I don’t expect the average daily views to flatten out. Given what I have seen, I expect them to continue to increase, although perhaps not as rapidly as they have over these last two months. How high will these numbers go? That is difficult to say because I am still learning what affects the trends. I thought it would be difficult to reach 100 page views/day and I am already verging on 200/day. I think it would be reasonable to expect 300 views/day by the end of the year, but I might be conservative in this estimate. We’ll have to wait another 6 months to find out. Looking at the categories that these posts represent (excluding the home page and About page), it looks like people are looking mostly at posts relating to science fiction, writing, and tools like Scrivener and the iPad. And that makes sense because that is mostly what I write about on the blog. I’ll also point out that most, if not all, of these posts got some kind of signal boost from a major source, like SF Signal (via their tidbits) or retweeted by someone with a higher profile than me. That helps quite a bit. I have posted 205,000 words of new content in the first 6 months of 2011. I was pretty surprised when I saw this number, but there it is. I will post again at the end of the year and try and do a better all analysis of the stats for the blog. Also, if I happen to spot an interesting trend before then, you can expect a post about that trend. And of course, I’d be¬†interested¬†to know about other people’s experience. You don’t need to report your stats if you don’t feel comfortable doing that, but I’d be particularly interested in what you find works for you. How do you attract new readers? How do you keep them? I imagine that folks who have published novels (as opposed to short stories) might find a wider audience than I do. That would be another interesting data point. Help with some great SF novel openings?